Waves of change have rolled through the desert wine scene over the past few years. On any given week, especially in season, wine lovers can choose among a growing number of wine dinners and winemaker events, most of which offer diners and tasters the chance to stock their cellars or to purchase a few favorite bottles. 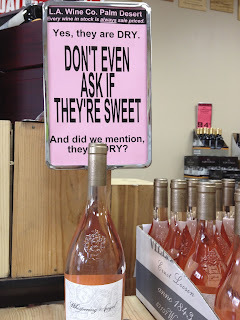 A funny shelf-talker at the now-closed Palm Desert LA Wine location. Country clubs and other venues have also gotten creative, giving members or invited guests the chance to sample and buy wines at close to wholesale prices, practically direct from the distributor. Seasonal residents can often purchase enough wines for the season without ever having to venture out to a wine shop, which can make it tough on some local small wine businesses. The 2013 arrival of Total Wine and More in Palm Desert brought a huge selection of wines from around the world in all price ranges to desert residents, satisfying connoisseurs and bargain shoppers alike. Customers who before might have favored the smaller wine boutiques now had another place to spend their wine dollars. Besides its frequent in-store events and trained staff, that superstore also offered a convenient location, ample parking and extended store hours that folks working 9-to-5 appreciated. Since that opening and the increased number of private event wine-buying ops, Palm Desert has lost two wine shops, Los Angeles Wine Company and the local outpost of The Third Corner Wine Shop and Bistro. Both shops offered newbies and wine sophisticates personal attention and guidance. Plus, their wine selections were just plain fantastic, with the prices at LA Wine in particular hard to beat. Palm Desert still has Dan’s Wine Shop, and that’s a good thing for the valley. Run by Dan Sullivan, who split off from LA Wine long ago and opened his own shop on the north side of Highway 111 between Lupine and Sage, Dan’s features an ever-changing variety of well-chosen wines from around the world at great prices, whether you’re looking for a $15 bargain or a $75 splurge. Join his email list to attend minimally priced tastings in his cozy space. Ladies, leave the bulky handbags at home. La Quinta has a couple of shops that offer tastings, wine shopping and, in Old Town, a few food choices as well. Near Trader Joe’s on Washington is LQ Wine. Smaller than Dan’s, this shop offers moderate pricing and is a step up in quality from Trader Joe’s. Attend a tasting to see how this wine shop’s selections match your tastes. On Main Street in Old Town, La Rue Wine Bar offers dining, wines by the bottle, wines by 6- or 9-oz pours and live music. Besides familiar choices, they also offer a number of what they list as “Interesting” wines, such as a Cabernet Franc from Jeff Runquist. In the West Valley, which lost Vino 100 back in 2011, Desert Wine and Spirits remains a Palm Springs destination wine shop, located inside the Go Deli Market on South Palm Canyon near Ramon. Headed by Zola and Costa Nichols, this shop offers excellent prices, well-chosen selections, Saturday tastings and in-store events. They also have grab-and-go deli items, sandwiches and gifts. Costa maintains an informative blog with tasting notes of their winner-laden revolving wine stock. These smaller shops offer a number of distinct advantages over the big-box stores and grocers, especially when it comes to service and being responsive to your budget, needs and taste in wine. However, bigger wine sellers have also stepped up their games in recent years. In another post, we’ll explore some great finds and tips for shopping at locales such as Costco, Trader Joe’s, World Market and local grocers too.